USPS Glorifying Anti-American, Communist Racist on a Stamp! I am disgusted. Every day it's something new and appalling. I send out 2-ounce shelter brochures daily. Not enough to make postage metering necessary. So I buy sheets of the appropriate postage at the local Post Office. Since the latest postage price hike, I've been given sheets of 61-cent wedding cake stamps. Not really my favorite for what I mail out, but OK--whatever. But yesterday, I asked for sheets of $.61 cent stamps and I was given a new stamp. The person on the stamp is Richard Wright. It shows a picture of him--a black man in front of what appears to be an inner city-scape. The name rang a bell for me right away but I could not place it. I just researched him and found that he was an avowed, card-wielding Communist Party member who wrote widely recognized black-power types of novels back in the 40s and 50s. In fact, he left America and disavowed his American citizenship. Now what the hell kind of message is this? We put all kinds of mindless stuff like comedians, movie stars, wedding cake, cheeseburgers, and whatever on our stamps--and OK. No big deal. But if the United States Postal Service is going to start promoting and celebrating anti-American, communist, racists on stamps, that is well over the line. I called the US Postal Service to express my displeasure and couldn't get anywhere of course. And no, I won't use those stamps even of I have to put sixty-one one-cent Lincoln stamps on each brochure. This is one of those things that I suppose some liberal genius in the USPS bureacracy thought would be funny, but here's hoping more folks will pick this up. In fact, I also just forwarded this on to Glenn Beck. I bet he'll chew on it a little and spit out some interesting commentary. Edited to add: See follow-up post here. 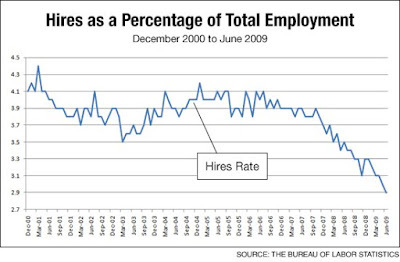 Sometimes a picture is worth a thousand words (or a few million jobs). To read the accompanying article from National Review Online, click here. Jim Baxter: "Peace is not a cause - it is an effect"
I received a rather profound email today from a gentleman by the name of James Baxter. Mr. Baxter is about 83, I believe. He is a WWII and Korea USMC combat vet, is a "point-man/follower of The Lion of Judah," and he has a great deal of understanding and wisdom to impart, based not only on his life experiences but more importantly on the Word of God. I encourage you to go to the linked essay and read it through. The man has some thought-provoking words of wisdom that apply today like a boxing glove to a fist. Every September, I recall that is more than half a century (63 years) since I landed at Nagasaki with the 2nd Marine Division in the original occupation of Japan following World War II. This time every year, I have watched and listened to the light-hearted "peaceniks" and their light-headed symbolism-without-substance of ringing bells, flying pigeons, floating candles, and sonorous chanting and I recall again that "Peace is not a cause - it is an effect." I'm fortunate to have been provided a pre-publication review copy of James Wesley, Rawles' new book, "How to Survive the End of the World As We Know It." The book is due out September 29. In a nutshell, it's an excellent, well-organized handbook for the thinking man (or woman) who wants to be absolutely ready for uncertain times. Rawles is preeminently known around the world as an expert in many of the related fields surrounding survival in the 21st century. His blog, www.survivalblog.com is number one in an increasingly crowded field, and for good reason. The man has demonstrated impeccable character and judgment and encyclopedic cognizance through the years. His background and training were years in the making, but his expertise was quickly recognized in his first best-seller, "Patriots, a Novel of Survival in the Coming Collapse." Since then, Rawles' blog has exploded in application and acclaim as people struggle to come to terms with a threatening world increasingly discouraging and unfamiliar. In fact, his following is as loyal, respectful, ardent, and eager to contribute as an online audience comes. In this latest major contribution to the survival genre, Mr. Rawles has put together some of the best advice and guidance for beginners and experts alike that can be found in one place. Can anyone today actually feel in control without having consulted the extensive knowledge base of THE guy who hundreds of thousands of like-minded individuals rely on? I too am in the field of survival. With a similar background to Jim Wesley, Rawles, my calling was to find a way to get people needed supplies and gear in the most economical and trustworthy ways I could arrange. There are a fast-growing number of people like us who understand that our future will likely call upon people everywhere to fall back on traditional skills and habits and draw upon resources that today most would see as quaint, remote, and even disagreeable. To get a clear view of the future, one should take an unbiased look into the past. We have built up a complex, fragile society relying upon technologies that literally provide most of the population with crucial life support. Any leg holding up that immense infrastructure that supports modern life can suddenly give way. If that happens, it could bring about a total, irreparable collapse of the whole shootin' match ... in dramatic fashion. We know from events like the Hurricane Katrina aftermath that rescue and rehabilitation initiatives from the great I-AMs in federal high places will be sorely inadequate. Lesson learned--be personally ready or suffer greatly. I like to give practical gifts away to my customers, friends, and relatives. Sometimes, these gifts are potential life-savers. Eye-opening books such as "How to Survive the End of the World As We Know It" are perhaps the most popular and well-received gifts I give away. I know this title will change some lives, so I already have my initial order in for several dozen copies. That is the best way I can express my appreciation and endorsement for a product--and this book is worthy. Public Discourse Ultimately Being Fanned Into an Inferno? In the last week or so, we have all been watching the media reports and YouTube videos clearly detailing the anger and frustration being brought to a boil in America. The health care debate and the way it is being fast-tracked by congress is seen potentially as an emotional tipping point for a majority of the U.S. population. Hard-working, law-abiding citizens had been stunned incredulous up to this point by the arrogance of an over-the-top control-grab and series of financial misappropriations by the new sheriff in town. But the wake-up call has been sounded. 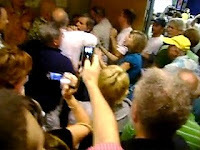 Tempers everywhere on all sides are quickly ascending to levels not seen in a long time in most circles. It's more than just political gamesmanship. The personal, class, and ethnic accusations and contempt going around and around are stoking the flames to a point where you know something is going to have to happen soon to release building pressure. In the past, government officials have largely succeeded in managing and venting similar polemics before they blew out of control. This time however, the barrage of confrontational issues on the sensibilities and values of traditional America seem to be obviously contrived and directed by certain political leaders to bring about conflagration. Those pumping the bellows are not backing away. And there are plenty of anxious, angry, and hateful manipulatees getting motivated by the tense dynamic. This spring I wrote a blog entry or two about our new vegetable garden. A LOT of people around the country are gardening for the first time in years, and in our case, it was our first bonafide garden in about 25 years! That long period of down time did not mean that we were going to be tentative about jumping back into the dirt. Our new garden was to end up bigger than I initially figured I should try. It was carefully and lovingly designed and prepared. And yes, I invested more money than made obvious sense (figuring that through the years ahead, those investments in a new tiller, tools, bird netting, and fencing WOULD be looking better and better). We planted all organic, non-hybrid varieties, used organic techniques through the summer, and tried to keep up with the weeding (to varying degrees of success), watering, and harvesting. One of the better decisions I think we made along the way was to go with dehydrating most of our crops. This decision was the best available option since we have a newer model glass-top stove. The stove manufacturer recommends not to use it for canning as it may break the glass-top. So I purchased an Excalibur Dehydrator and have become quite enamored with it. Bottom line--a first-rate food dehydrator makes relatively quick work of putting away the harvest. The dried food is lightweight, takes up little space, and stores for years in a cold dark area if you keep air and light away from the food. I just came across this excellent article on dehydrating food (with some talk about canning as well). If you are new to gardening this year or have not dried your crop before--read and enjoy: "Dry it. You'll like it!" by Jerry Cook. Peter Schiff: "Happy Days Aren't Here Again"